We will compile and share them! By the people, of the people, for the people! Note: You need to make the pie crust 4-12 hours before you want to make the pie. A big scoop of Party spirit! 1. In a large bowl, mix the apples with lemon juice and lemon zest. 2. Mix sugars, flour, cinnamon and nutmeg in a separate bowl; add to apples and mix well. 8. 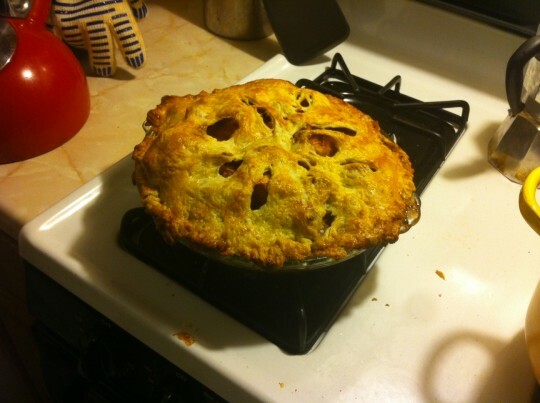 Allow pie to cool before serving. This allows the pie to set. 8. Share with your community and celebrate! 1. Mix the flour and salt in a large bowl. 2. Cut in the butter until the mixture resembles coarse crumbs. 3. Stir in the ice water, a tablespoon at a time, until the crust mixture forms a ball. 4. Wrap dough in plastic wrap and refrigerate for 4 hours or overnight. 5. Sprinkle flour onto rolling surface. Roll dough out, then divide in half. Roll each half to fit a 9-inch pie plate. 6. Place crust in pie plate, pressing evenly into the bottom and sides. Savory and a little bit sweet, these are wonderful as a snack, served along a bowl of soup for lunch, with a chunk of cheese as an appetizer, or with a drizzle of honey for an unusual dessert. Position a rack at the center of oven and preheat oven to 375° F.
Peel and core the apples, then cut them into small chunks. Placed them in a single layer on the baking sheets and roast until they are slightly softened and feel dry to the touch, about 20 minutes. (If they feel very soft but not dry, you have probably used a softer apple; further oven time will not dry them out, but they will still be fine to use.) Let the apples cool completely on the counter or in the fridge before making the rest of the dough. Leave the oven on if you will be continuing with the rest of the steps soon, otherwise this step is a great make-ahead the night before. Place the butter in the freezer for roughly 15 minutes, until firm. Grate with a box grater to get even shreds. Add these to the bowl of a stand mixer with a paddle attachment (or a bowl you can use a hand mixer with), along with the cooled apple chunks, salt, sugar, cheese, cream, 2 eggs, herbs, and onions (if using). Beat for 30 seconds until uniformly mixed. Sift the flour and baking powder together over the bowl, then beat on low until just combined. Do not over-mix. Scoop onto baking sheets that have either been lightly buttered or lined with a fresh sheet of parchment paper. 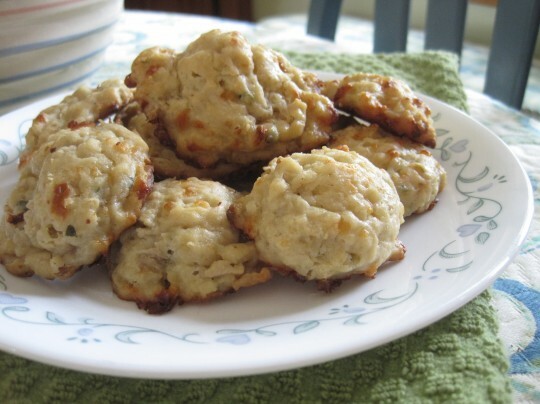 You can make these any size you want, from bite-size to large biscuit-sized. I always find that a scooper with a sweep mechanism works best for this kind of sticky dough, but spoons are just fine. Beat the remaining egg in a small bowl with a pinch of salt. Brush the scones with the egg wash and sprinkle them with the sugar if you desire a sweeter version, or salt for a savory one – either way what you’re after is better browning on top and a little crunch. Bake until firm and golden, about 15-30 minutes (15 for small bite-size ones, more for larger sizes). With a spatula, lift them to a wire rack to cool for 10 minutes. They are slightly addictive warm from the oven. Do ahead: This makes a fairly large batch, and these biscuits are best only for a few days after baking. However, it is very easy to bake only part of the batch and freeze the rest formed but unbaked (without the egg wash). When you want to use them, you don’t even need to bother defrosting – simply brush them with the egg wash and sprinkle with salt or sugar, and bake them still frozen for just a few extra minutes. A wonderful, tangy salad for any time – great for picnics or anytime you want to transport food; without dairy, it’s fine out at room temp for extended periods. Add all the dressing ingredients to a large jar with a secure lid and shake well until combined. Or whisk together in a bowl. Combine the salad ingredients in a large bowl and toss with the dressing, adding only enough to coat all the vegetables. Chill until ready to serve / transport. 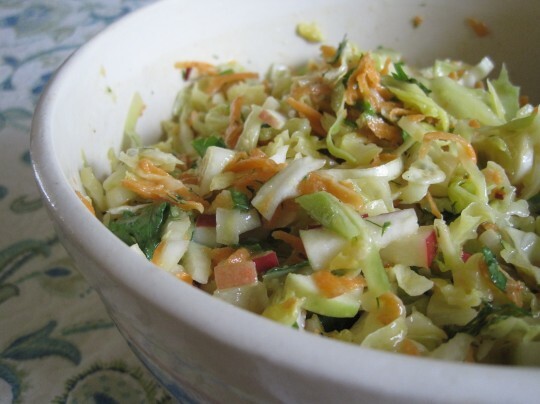 It’s best to let this rest for an hour or so after mixing together to allow the flavors to mellow; the cabbage will also soften a bit and exude some juice. Or let it sit for up to 24 hours if you like. Mix again before serving. Sunflower seeds or walnuts would add a wonderful extra crunch and creaminess to this salad, but add them at the last minute so they don’t get soggy.